Many cookie recipes call for creaming butter and sugar together. Naturally, baking elves out there want practical tips for this important step in baking homemade cookies. Here are a few! To be technical about it, creaming butter builds small air pockets. As you beat the butter or margarine with an electric mixer or a spoon, the movement allows in tiny pouches of air. Meanwhile, the butter’s mass is interspersed with the sugar crystals, setting up the dough structure. The air pockets give room for the leavening agent (like baking soda or baking powder) to work its magic and expand. In other words, when you cream properly, cookies rise. You simply need to be careful to not over mix when creaming butter. But more about that in a bit. Before mixing your cookie recipe, set the butter (or margarine or shortening) out on the counter for at least an hour or until it becomes room temperature. You may even want to consider setting it out over night. For instance, if you know you will bake cookies in the evening, set out the butter in the morning or after lunch. Butter will not spoil if left out on the counter for even days at a time. How can you know if butter is ready to be creamed? It should feel soft, but not warm or gooey. Poke it with your finger. If the pressure leaves a slight indentation in the butter, it’s ready to go. Slice the butter into cubes. Set cubes into a mixing bowl. Use a wooden spoon to beat the butter in a circular motion until it is a soft, smooth mass. Add sugar to the butter, using the tines of a fork to incorporate the two ingredients together. Stir the butter and sugar together with a wooden spoon in a circular motion until well-blended (fluffy and light yellow, with a ridged surface), continually scraping the sides of the bowl. 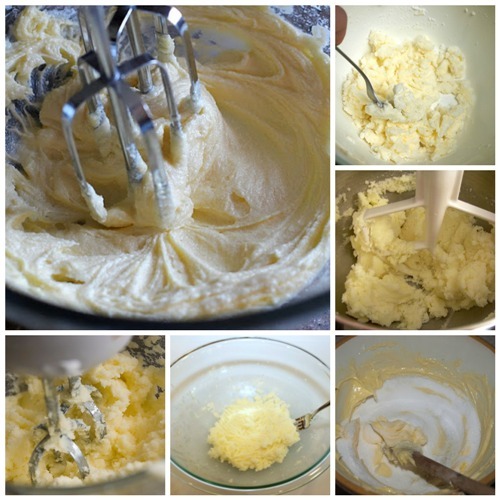 Set the mixer on low to beat butter until cubes are combined into a soft, smooth mass. Set the mixer on medium and beat butter for about 1 ½ minutes. Use a rubber spatula to scrape the bowl. Add the sugar gradually, continuing to beat the mixture on medium speed for about 5-7 minutes until it is well-blended (fluffy and light yellow, with a ridged surface.) Scrape the bowl often. Be on the lookout for three indications that butter and sugar are well blended. The butter nearly doubles in mass. This gives the appearance of fluffiness. The butter-sugar combination has lightened to a yellowish-white color. The surface of the mixture forms tiny ridges or peaks. If you get too excited about creaming and over mix, then the butter and sugar separate. When the butter and sugar separate, that means fewer to no air pockets in the dough. Fewer air pockets means the leavening agent has less room to expand. The cookies cannot rise … and will be flat. Make sure you beat the butter by itself until it is soft and smooth. Add the sugar after the butter has begun to expand in mass. Scrape the mixing bowl often. This allows you to pause and look at the mixture to make sure you’re not over mixing. Scraping also allows the butter and sugar to be mixed together consistently.